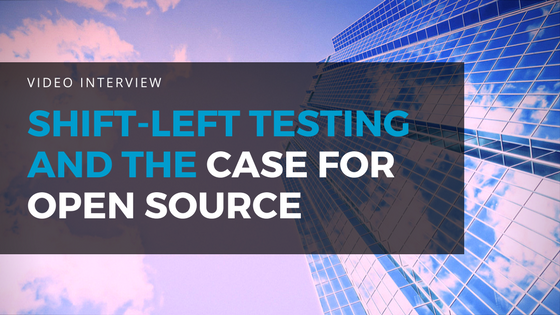 I recently visited the offices of CA Technologies (one of Abstracta’s partners) in Santa Clara, where I had the chance to discuss shift-left testing, continuous testing, and why and how to turn to open source solutions to accomplish them. Check out the (then) live broadcast of our chat with CA Technologies’ Eric Odell, Director of Continuous Testing Solutions Marketing, and Refael Botbol, Performance Testing Domain Expert. First off, if you are not clear about shift-left testing or continuous testing, continuous testing is the notion of testing throughout the development cycle, as opposed to only at the end, which is typical within waterfall environments. “Shift-left” testing is how this is accomplished, as it shifts the beginnings of testing to earlier stages, allowing developers to integrate testing into their daily activities and take more ownership of building quality code. For shift-left testing to take off in an organization, a great change in culture must occur first. Teams are usually set in their traditional ways of working, and when they consider shifting, they must consider how the methods, processes, skills, tooling, etc. will need to change. Even more important, what will need to happen to get all the roles within the organization to align properly? The TCOE (Testing Center of Excellence) will find itself delegating some of its work to the developers, assigning them more testing activities. In the teams who do this best, the testers become “coaches”, training developers on how to write better code, avoid bugs, and own unit testing. The advantage of this is that the tester who used to be busy, frantically writing all of the test cases, now has time to delve deeper into the product, working on business cases, penetration testing, performance testing, and so on. This sharing of the responsibility for QA leads to a higher level of achieved quality, as more of the bases get covered. Why Are Enterprises Shifting to Open Source? 52% of surveyed enterprises are leaving legacy testing solutions and shifting to open source. So, how do you actually make the jump? Undoubtedly, like all things worthwhile, it will require some effort up-front. Luckily, BlazeMeter has released an incredible, free tool that converts legacy scripts (LoadRunner HTTP to JMeter and LoadRunner TruClient to Selenium) to open source in a matter of minutes. The scripts may need some minor tweaking and perfecting afterward, but it will save the team a tremendous amount of man hours. Want to see it in action? Watch as Refael Botbol shows us how easy it is to convert a script to in the video below or simply visit shiftleft.blazemeter.com and try it for yourself! If you are looking for some guidance in your effort to shift-left, our team is here to help. Feel free to send us a message and we’ll be happy to discuss actionable steps to make it work for you!